item | Viva Clipper ! an array of element #'s of tagged items in the array of fields. [cMark]       - character used to mark as tagged. We are continuing with Viva_HMG.hbp, Main.prg and Main.fmg. 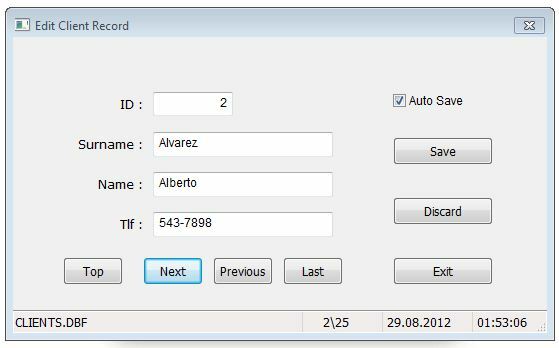 While using a table and while navigating between its records, we need some extra info to show to user: Name of table, current record and record count in the table. So user always feels comfortable by knowing where is he / she; which table, which record? 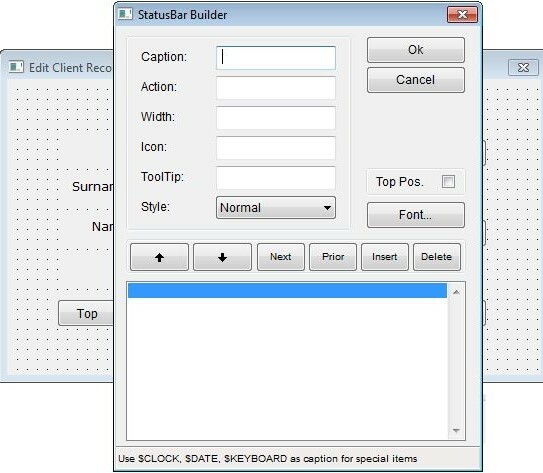 The status bar control is convenient for this purpose and though this is a quite simple control, IDE has a builder for it: Status bar builder. After define status bar, we need assign values to its items. We don’t need assign values to DATE and CLOCK items, because these items will be updated by system (HMG) automatically. Change ON INIT event of EditReco form from ReadData() to InitEdit(. And add this line at end of ReadData() procedure. Whenever active record change, Item( 2 ) of Status Bar will be updated ( 5/25 ) in above picture. 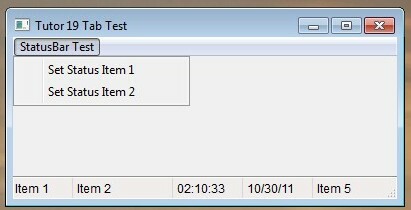 In this step, user must use “Save” button every time current record edited. Whereas “Read” process is different; whenever current record changed, values of text boxes automatically updated. What about automatic save? May be, we can do this; but user may don’t want such automation. Asking a question like “Do you want save?” every change doesn’t a good way. The better way may be: put a control to form such “Auto save” with On / Off option. Yes, fortunately we have such control: Check Box. Now, how we will implement Auto Save process?. 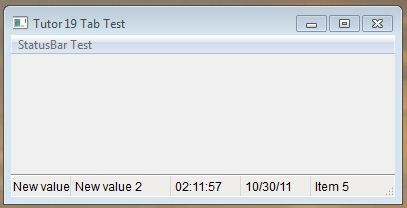 MsgMulti ( aka MsM) is a message function accept multiple and any type of data. Download here ( source only ). 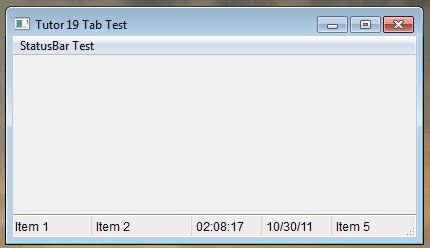 Win_1.StatusBar.Item(1) := "New value 1"
Win_1.StatusBar.Item(2) := "New value 2"
There is various alternatives to get an user’s choice besides RadioGroup. 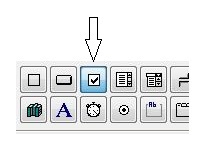 Using a Listbox, you can add, change or remove items at runtime.